Samantha and Charlie Leach. 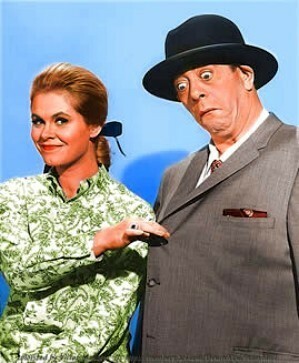 Elizabeth Montgomery and Robert Strauss. Robert starred as Charlie Leach in the episodes Follow That Witch and The Catnapper. He discovers Samantha's secret - that she's a witch!. Wallpaper and background images in the Bewitched club tagged: bewitched elizabeth montgomery robert strauss follow that witch episode photo. This Bewitched photo contains business suit, suit, suit of clothes, well dressed person, suit, pants suit, and pantsuit. There might also be green beret, special forces, elite soldier, slack suit, and pinstripe. I always though that Charlie would eventually turn up again and really be Samantha's undoing but she fixed him well when she twitched him into the middle of bullfighting arena in Mexico. Charlie never bugged her again,lol!